In May of 2010, Kelly and I took an amazing two and a half week trip to Ecuador and the Galapagos Islands in South America. We spent a little time in the capital city of Quito, but otherwise we were off enjoying the jungle lodge in the cloud forest of Mindo, exploring the Galapagos on a small boat that was our home for seven nights, enjoying whitewater rafting, volcano-heated hot baths and great food in the mountain town of Banos, and checking out the sprawling and lively markets of Otavalo. These posts describe our adventures; you can also read a summary of the whole trip. The Throat of Fire speaks! We might have mentioned that Banos is located at the base of a volcano, Tungurahua (which means "throat of fire" in the local tongue). Well, literally at the moment we were pulling out of town this morning, that volcano erupted. As in, the road we were on closed as we were on it, police cars and ambulances sped by, and we saw the ash cloud forming behind us. The locals pretty much dropped what they were doing to line up along the road to watch, so we knew it was a big deal. Exciting! The road was eventually opened at least temporarily, and we sped off into the hills (and we made it to Otavalo where I write from). Do we have good timing or what? The spoiling of ourselves continues. After our "perfect day" we decided it was time to challenge ourselves a bit, so we'd signed up for a whitewater rafting tour on the nearby river Pastaza. We were a little nervous about it (okay, mostly Kelly) - was it going to be safe, would the guides speak enough English, were they REALLY going to be class III-V rapids as advertised? - but we took a leap of faith. It paid off - we had some of the best rafting that either of us have ever experienced. It turned out that they were Class IV+ rapids - not exaggerated at all. Not only that, they were one after another - no leisurely floating down the river in between to recover your senses. Huge waves, broken paddles, screams of disbelief, kayaker trapped upside down, dangerous water dynamics, the guide always yelling "FORWARD, FORWARD," and so on. Chris has never heard as many, um, un-pastorly like words out of Kelly's mouth in one sitting before. Sitting at the front of the raft, Chris never swallowed so much river water in his life. But we both stayed in the boat (a real achievement, we'll show you the video! ), pulled more than our weight in terms of paddling, and greatly enjoyed the camradarie with our fellow boatmates. No sea-sickness this time around. 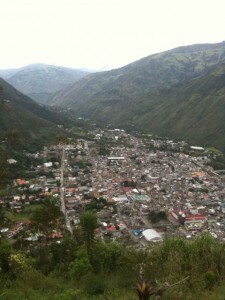 In our last post, we were obviously a little travel weary, thus the declarations of permanent residence in Banos, Ecuador. The travel weariness has worn off, but we're still ready to declare Banos a prime destination for other reasons: it's truly a bit of paradise. We came here with the intention of staying two nights and then working our way north, but we ended up staying four nights, and we're still sad to go. As I mentioned before, Banos seems to be the Ecuadorian equivalent of Boulder, Colorado - an outdoorsy person's Mecca buried in the mountains, with myriad activities you can take on to pass the time. Every block offers touring companies that will take you rafting, kayaking, canyoning, jungle tripping, go-carting, mountain biking and more. There are trails extending up to the volcano and surrounding volcanic formations that range from steep to "are you kidding me?" The best part is that once you're done with your outdoor adventure, this place knows how to help you relax. 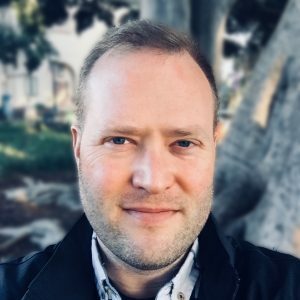 There are natural baths with water heated by the volcano, massage and spa companies on every block (most professional, some not), and so many different restaurants representing cuisine from around the world, it can take an hour to decide what to eat. We are currently at the foot of an active volcano in Banos, a small town deep in the Andes that is part Santa Fe, part Boulder, and part San Luis Obispo, with an Ecuadorian twist. We're so glad to be here after the most ridiculously harrowing (but incredibly beautiful) 3.5 hour bus ride through the mountains that we've decided we can't stomach the idea of ever leaving. Perhaps this beer at this cute little cafe will take the edge off, or perhaps one of the many leisure activities offered on every corner: volcano hikes, rafting, horseback riding, massages, etc. In any case, this is home for a while, and (have I mentioned?) we're so glad to be here. Hi there! We're back at our "usual" hotel in Quito, preparing for our final week in Ecuador. It's pretty wonderful to be back on land after eight days on a boat - more about that in a moment. 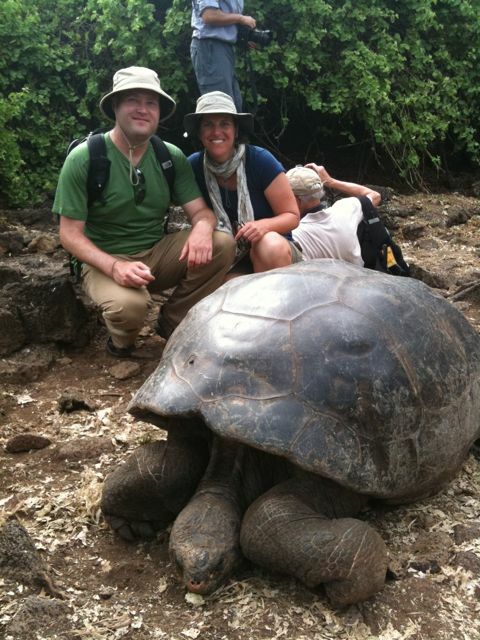 Our time in the Galapagos islands was phenomenal. Words here won't do justice to the things we saw and experienced there, and even the tons of photos and video we're bringing back with us can't fully capture it. Having finished our time on the motorized yacht Eric, our home for the last week, we're just laying around with the local sea lions at the beautiful waterfront park on San Cristobal Island. Our flight back to Quito departs shortly. More details, including sea sickness horror stories, coming soon. 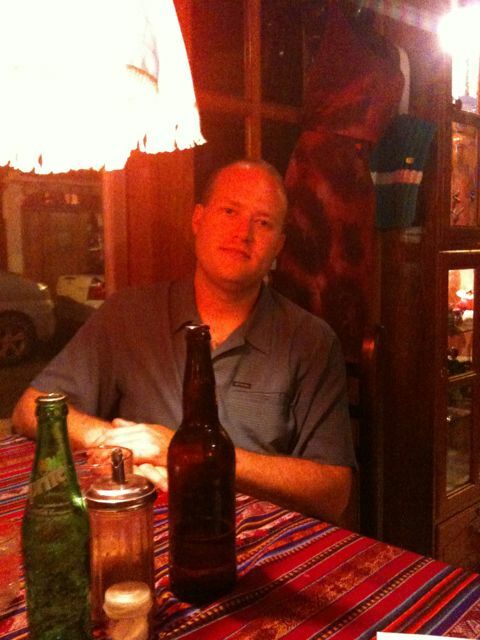 Okay, we're back in Quito for the night, let's try this blog post again. On Thursday morning we met up with Guillermo Valencia a local driver/guide recommended by our hotel. He did a great job of narrating the landscape of Quito - physical, political and otherwise - as he took us out toward Mindo. We stopped along the way to stand on the equator (Chris tried to balance an egg on a nail and failed, Kelly successfully verified that water swirls in different directions on different sides of the line, etc. ), and to take in some stunning views of craters and volcanoes amid the lush jungles. This WAS a fairly detailed post about the amazing experiences Kelly and I have had the last few days in the cloud forests of Mindo, but the internet connection and computer in this Internet cafe were flaky enough that this update is now gone, and this very short update will have to suffice. 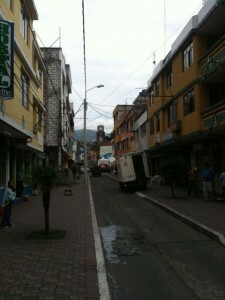 We´re about to get on a bus back to Quito (two and a half hours on winding dirt roads in the mountains - wish us luck!) 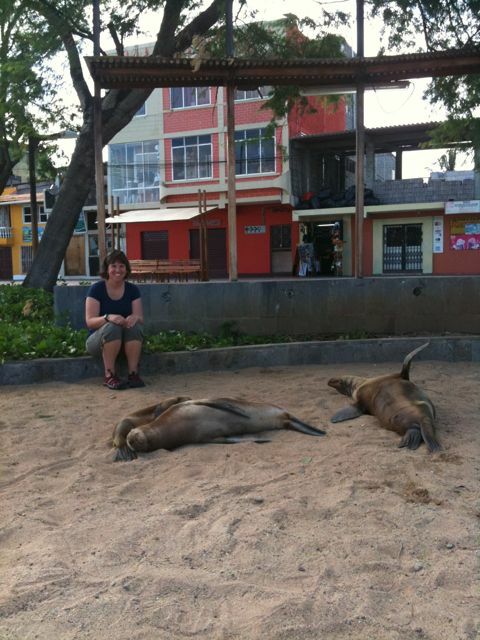 and then tomorrow we´re off to the Galapagos. I´ll try to recreate the longer post later tonight if time allows. We´re having a great time. More soon.